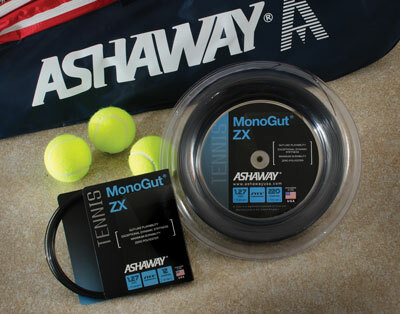 Ashaway, RI - Ashaway MonoGut® ZX tennis string claimed the honors at a recent Challenge hosted by Ashaway at the 2016 PTR Symposium in Hilton Head Island, SC, on February 15 - 21. During the Challenge, 15 Professional Tennis Registry members played back-to-back five-minute singles drills with two identical racquets, one strung with Ashaway’s Zyex®-based black MonoGut ZX, and the other with a popular black polyester string. They then revealed which they preferred and why. Twelve of the fifteen, or 80%, preferred the MonoGut ZX string. For the Challenge, two identical Head Radical Pro racquets with identical grips were strung with MonoGut ZX and the poly. Racquets were strung identically by John Gugel, Tennis Industry’s recent Stringer of the Year, and were not used prior to the Challenge. The Challenge was conducted on an outdoor court using fresh Pro Penn tennis balls supplied by the PTR. Each player rallied hard for five minutes with each racquet, hitting groundstrokes, volleys, and serves. Ashaway MonoGut® ZX tennis string claimed the honors at a recent Challenge hosted by Ashaway at the 2016 PTR Symposium in Hilton Head Island, SC, on February 15 - 21. During the Challenge, 15 Professional Tennis Registry members played back-to-back five-minute singles drills with two identical racquets, one strung with Ashaway’s Zyex®-based black MonoGut ZX, and the other with a popular black polyester string. They then revealed which they preferred and why. Twelve of the fifteen, or 80%, preferred the MonoGut ZX string.